Birthday Monster Card & Tag! Hello! I hope you're enjoying your week so far :) This is our last week before school starts back - and my littlest will be starting Kindergarten!! OMG how did that happen?!! 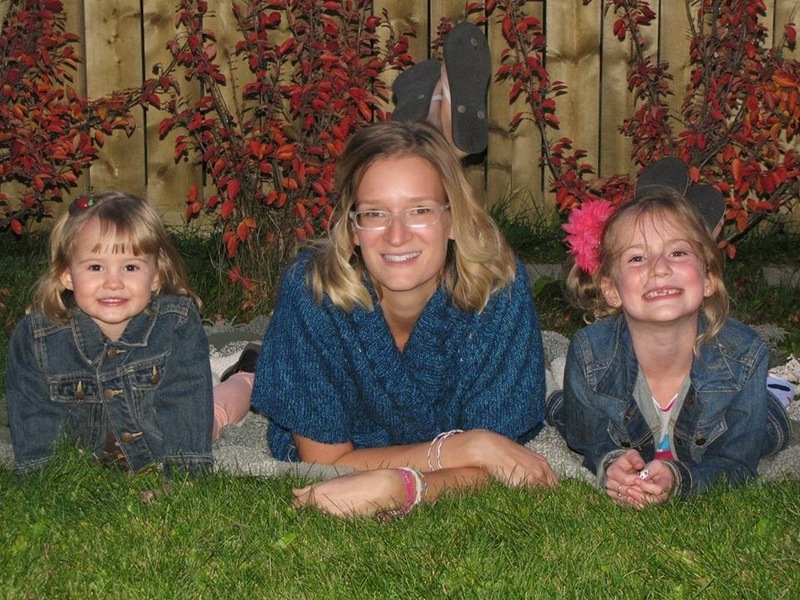 We've had beautiful weather and are definitely enjoying the last of the 'summer'. We even went camping this past weekend with friends and had a lot of fun. This camping trip has turned into a bit of a tradition where about 5 families get together, and we've managed to keep it going for the past five years! I'm back today to share this super sweet digi image I Didn't Eat It Yet Birthday Monster from GSD Stamps. 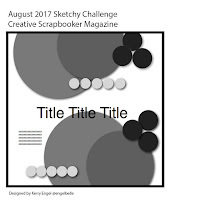 This is the August challenge image, and if you decide to link it up over at the August Challenge, you'll get the next month's image FREE! How cool is that! I coloured this cutie up with Prismacolor and Hobby Colour Markers, which are alcohol based and layered him (or her!) over a background I created with watercolour paper and Distress Oxide Inks. I stamped on a sentiment using a Recollections clear stamp from Michaels. The great thing about digi stamps is being able to resize them so easily! I printed off a little baby monster and created a coordinating gift tag. Of course I had to add some SpiegelMom Scraps sequins!! Thanks so much for stopping by! I hope you're having a great week. And I'm sending hugs and prayers for all those affected by the flooding in other parts of the world. Hello! 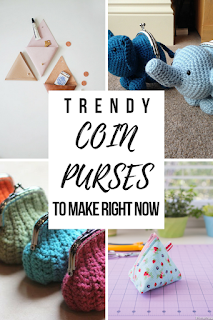 I'm back today with a few inspirational and crafty sites for you to check out while you're relaxing this weekend! We've had a wonderful busy few weeks with family visiting, park and swim dates, and I got lots of baby snuggles from this cutie, my niece! She's absolutely adorable!! 2) There's always lots of cool inspiration on the Sizzix Blog, and I thought this post featuring 10 Trendy Coin Purses was so sweet! 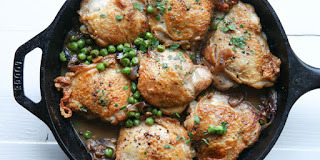 3) With school and activities starting up here in a couple weeks I thought the Delish.com website would be a great resource, and this post with 157 Quick Fall Dinners looks awesome to me! 4) The Everything Etsy blog has a great post featuring 7 Fall DIY Gift Ideas! Ok, Fall is my favourite season, and I can't help getting excited about it :) The Free Fall Leaf Embroidery Pattern they link to is beautiful! 5) Angie from ChicknScratch has started her 12 weeks of Halloween project videos! I love her cute little paper creations! Here's a look at her video for Week 1 for 2017. 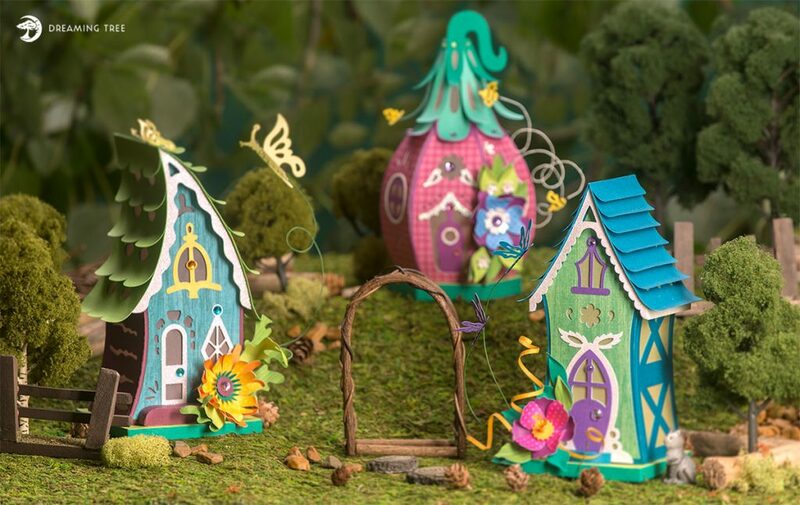 Well I hope this has given you a bit of inspiration to get crafty - or just sit back and enjoy some crafty ideas! Thanks so much for stopping by! Hi friends! 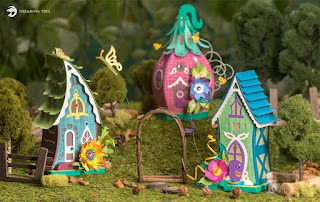 I'm over on the SpiegelMom Scraps blog today scraplifting the awesome Jen Schow! She is a scrapbooker that has such a natural talent - everything she does looks amazing! I just love the clean lined look of the page I'm using of hers for inspiration. It worked perfectly with the Project Life cards in my stash and a couple of 3x4 photos. Here's a look at what I created! Along with using up lots of the fun scraps in my stash I added these beautiful SpiegelMom Scraps sequin mixes - Sweet Pea, Deck The Halls, Ferris Wheel and Orange Blossom! Don't forget to use the code KARLA15 to save 15% off your order at the SMS Store! Thanks so much for stopping by! I hope you get a little crafty time for yourself this week :) Be sure to head over to the SpiegelMom Scraps blog to get all the details and closeups on this fun page! Kitty Bee Designs - Ice Cream Bear Card! Hello friends! I am sharing this adorable Ice Cream Bear digital stamp from Kitty Bee Designs over on the KBD blog today! There are still a few more weeks of summer, and I really want to enjoy them! This little bear eating a huge ice cream looks like he really wants to take advantage of the warm sunshine too ;) I love printing out my images on kraft cardstock for a change sometimes - and I love the way coloured pencils look on kraft, so that's what I decided to do. The stitched circle die from Kaisercraft made a lovely little border around the image, and I added some fun and glittery Stickles to his yummy ice cream. A few foam dots give the circle some dimension over top of the fun summertime papers. A bit of Raspberry Twine tied around the cut apart journaling card adds some bright colour and texture, and coordinates with the lovely summery Sweet Summer Vibes sequin mix from SpiegelMom Scraps (don't forget to use the code KARLA15 to save 15% off at the SMS store!) 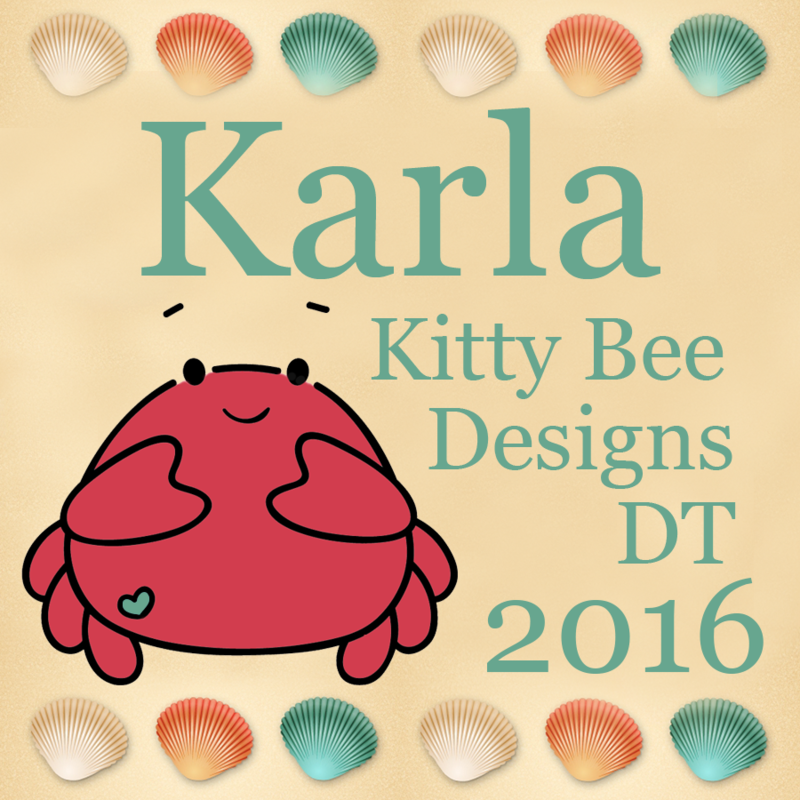 I added a cute sentiment from Pretty Cute Stamps to finish it off. SpiegelMom Scraps - Scraplifting Shimelle! I'm using the beautiful SpiegelMom Scraps sequin mixes Hey Kiddo, Honor Guard and Star Spangled on my layout today. For the full details and closeups head over to the SpiegelMom Scraps blog. And don't forget to use the code KARLA15 to save 15% off your order at the SpiegelMom Scraps shop!! 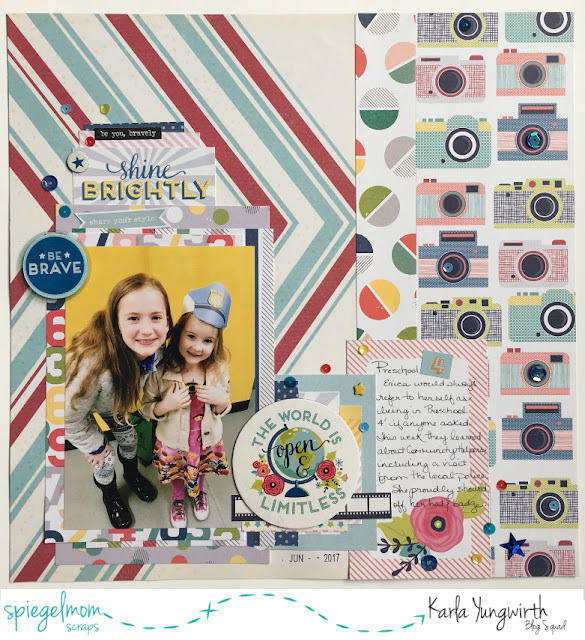 I've been chosen to work as a Page Kit Designer with the amazing online scrapbook store Scrap Shotz!! 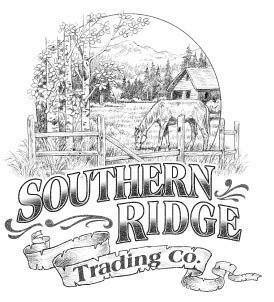 I'm so excited to work with the owner, Sandy, and such a wonderful and talented bunch of ladies. 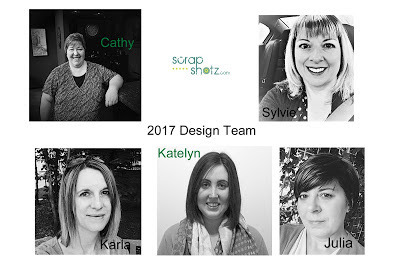 You can see all the details on the new team as well as the returning team members at the Scrap Shotz Snap Shotz blog. You can check out the online Scrap Shotz store here - they are in Canada, but ship Internationally, which is awesome! The prices are fantastic, with lots of deals - and if you are shopping from the US, your dollar is so much better than ours that you're getting an even better deal! Thanks so much for stopping by today and for being so amazing and supportive, my crafty friends! 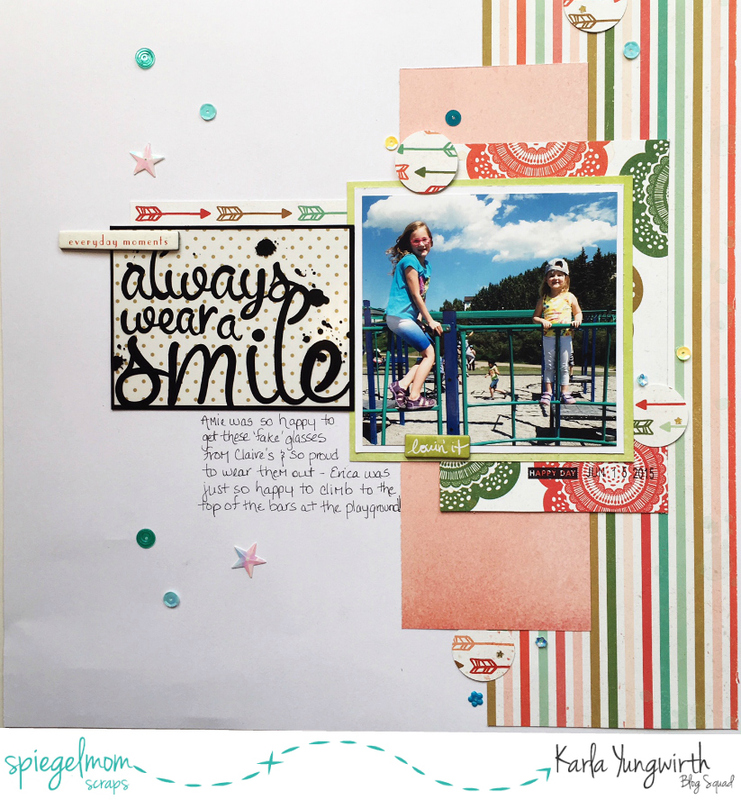 SpiegelMom Scraps - You Are Perfect Scraplift! Hello friends! This month is all about Scraplifting at the SpiegelMom Scraps blog - and today I'm sharing my scraplift of the amazing Katty Miranda! If you've never seen her work before, be sure to check her out! Today I'm using the Wild & Free and Jaded Hearts sequin mixes from SpiegelMom Scraps as well as the Kaisercraft Nesting Circle Stitched Dies available in the shop. Be sure to check out the SpiegelMom Scraps blog for all the details and closeups on this layout! 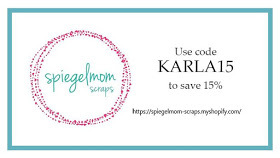 And don't forget to use the code KARLA15 on all your purchases at the SpiegelMom Scraps store to save 15% off your order! Thanks so much for stopping by today! Wishing you a fabulous rest of your week! Canvas Corp Brands Unboxing & VIDEO! Hi friends! 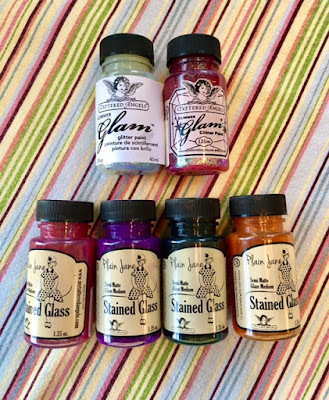 I wanted to share a box of goodies that I picked up from Canvas Corp Brands in July. It was full of amazing goodness and there was even some awesome sale stuff in there you might want to check out. I'll be using these products over the next few months, so keep your eyes open! And I also picked up these fun Stained Glass Paints and Glimmer Glam, but forgot to film them! 7gypsies YouTube channel, Tattered Angels YouTube channel or the Creative Studio blog! Thanks so much for stopping by today! Hope you're enjoying your summer and having a great week! FCCB #307 - At The Beach! 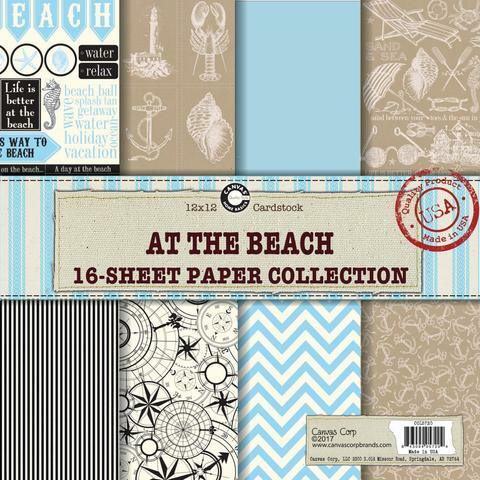 Make a project about anything beachy! 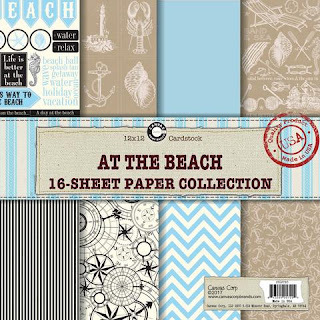 Today I'm sharing a scrapbook layout from a day we spent at the beach a couple years ago using the Cricut cartridges Pack Your Bag (beach ball), Summer Love (beach sign) and Dude! (Just Chillin title). 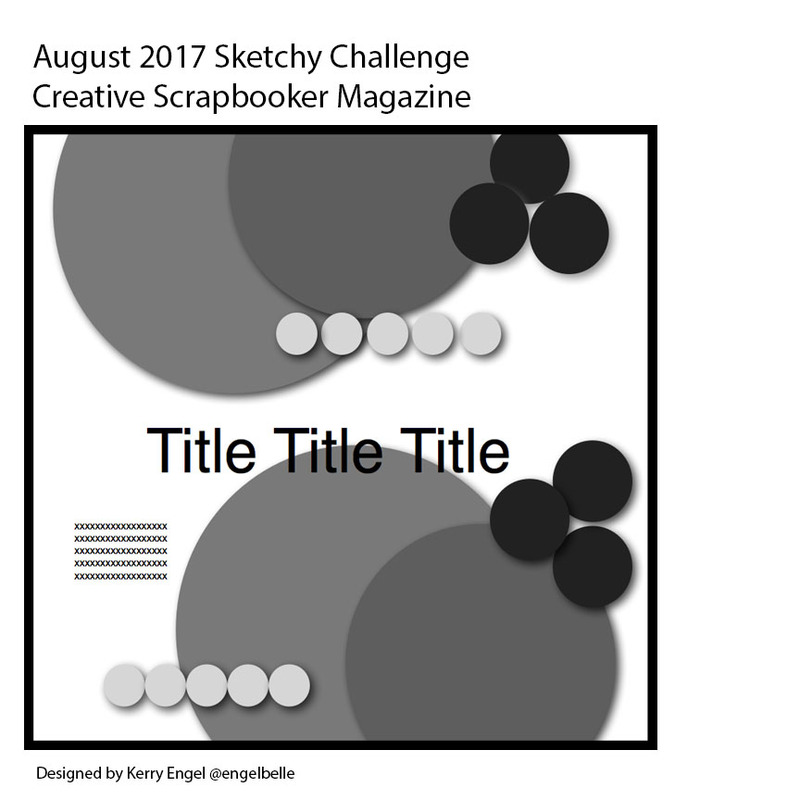 I used the new August sketch from the Creative Scrapbooker Magazine Sketchy Challenge and a CTMH circle cutter to cut my photos to fit. I even used some of the leftover photo of the sand to punch circles in. The typed sticker is from a Tim Holtz sticker book. I just love the sayings in it! The background and title is cut from a watercolour paper pad I just picked up from Michaels. I love that it easily cuts with the Cricut and has a slight variation in the colours to add interest to the diecuts. I even used some sequins to decorate the beach umbrella after shading the edges of the cuts with Distress Inks. Thanks so much for stopping by today! 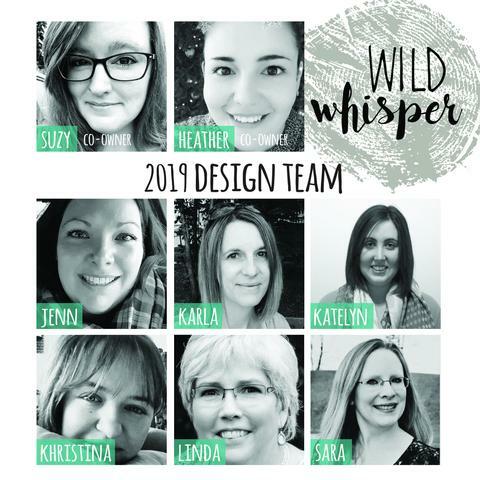 Be sure to head over to the Fantabulous Cricut Challenge Blog to see what all the other Design Team members have come up with, and enter your own project for a chance to win a prize from our awesome sponsor Dreaming Tree SVG! Hello friends! We've had a busy week this week; we went to the local amusement park, to the wading pool, lots of park time, to see the Emoji Movie - which was a hit! and had a water balloon fight in the backyard. 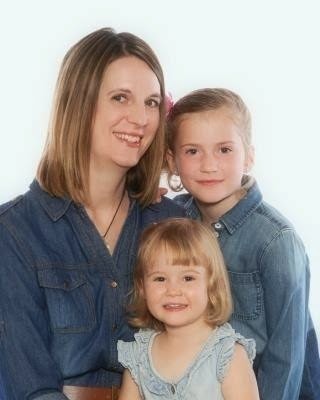 And, Amie, who's 10 has been baking up a storm! She made chocolate chip oatmeal cookies, which were really good, on Wednesday, and has made scrambled eggs and regular, blueberry and almond flour pancakes Friday morning as well as a grilled cheese sandwich for herself for lunch. Her dad bought her a mini griddle and she already has tons of recipes pinned to try! 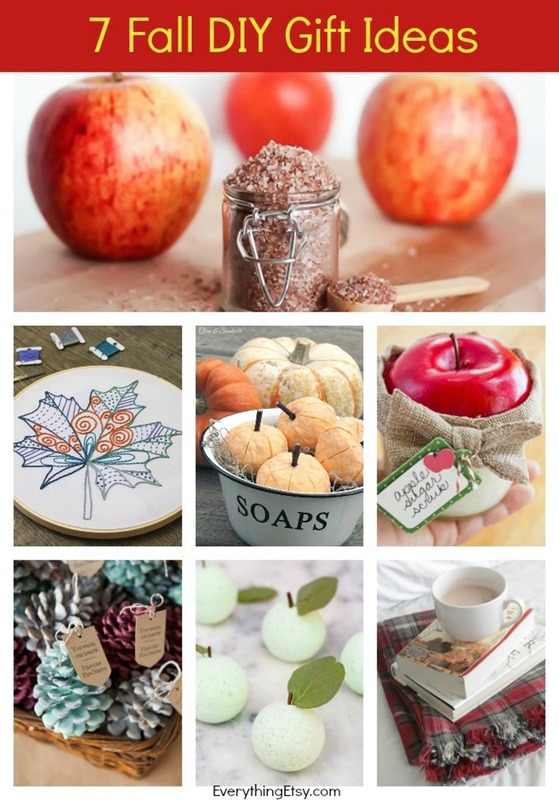 Here are some crafty inspiration sites, videos and freebies for you to check out! 1) I've really been enjoying finding some awesome home decor inspiration lately, and I was so impressed when I came across Bless'er House. You'll find some amazing 'drool-worthy' home decorating pics and tips on the Blog and Instagram feed! I'm warning you though, it's addictive! 2) Crafty Bit Creations has a great video tutorial showing four different Distress Oxide Ink backgrounds with the cutest mermaid stamps! I am loving playing with my first set of DOX inks, and I'm working on the second set! 4) Dreaming Tree SVG has the most adorable Fairyville SVG Bundle out, and it's free with a $9.98 purchase. Details are in the link! 5)And, lastly, Dawn Nicole Designs has a beautiful August tech calendar for you to download FREE for your computer, phone or ipad! If you sign up for her Happy Mail you'll always be notified everytime she has a new one available. Thanks so much for stopping by today! I hope you have a fantastic weekend. SpiegelMom Scraps - Always Wear A Smile Scraplift! Hello friends! 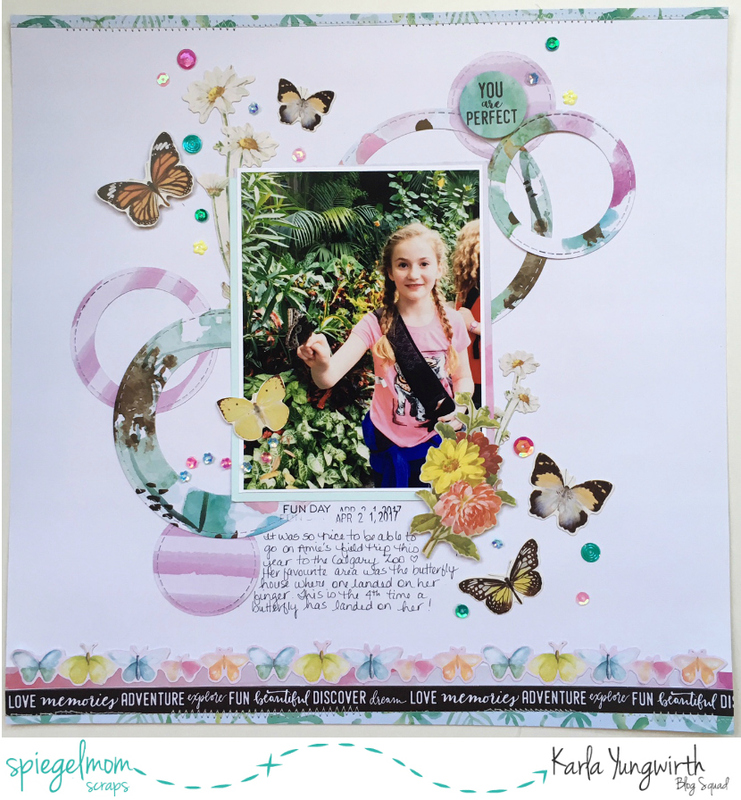 I'm on the SpiegelMom Scraps blog today with a fun scraplift of the awesome Kat Benjamin! I just love her clean style and this was a really fun page to make. You can check out the details on her layout HERE. And here's a look at my layout using the new SpiegelMom Scraps sequin mixes Star Spangled, Girly Glitter and Ferris Wheel! 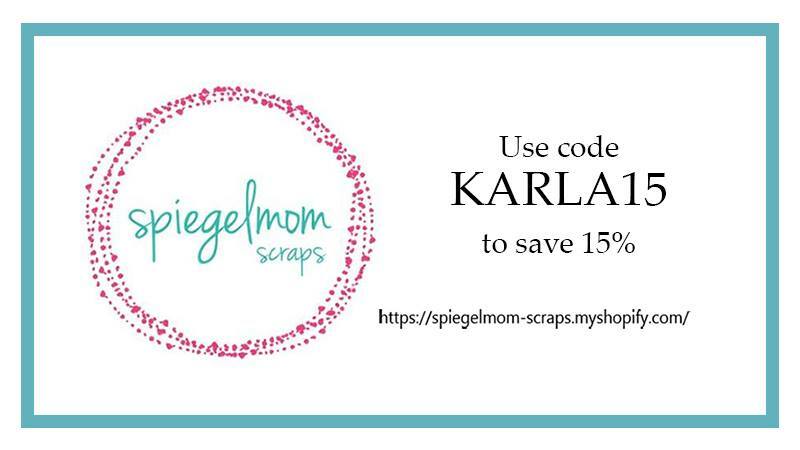 Be sure to use the code KARLA15 to save 15% off your order at the SpiegelMom Scraps Shop! Thanks so much for stopping by today! 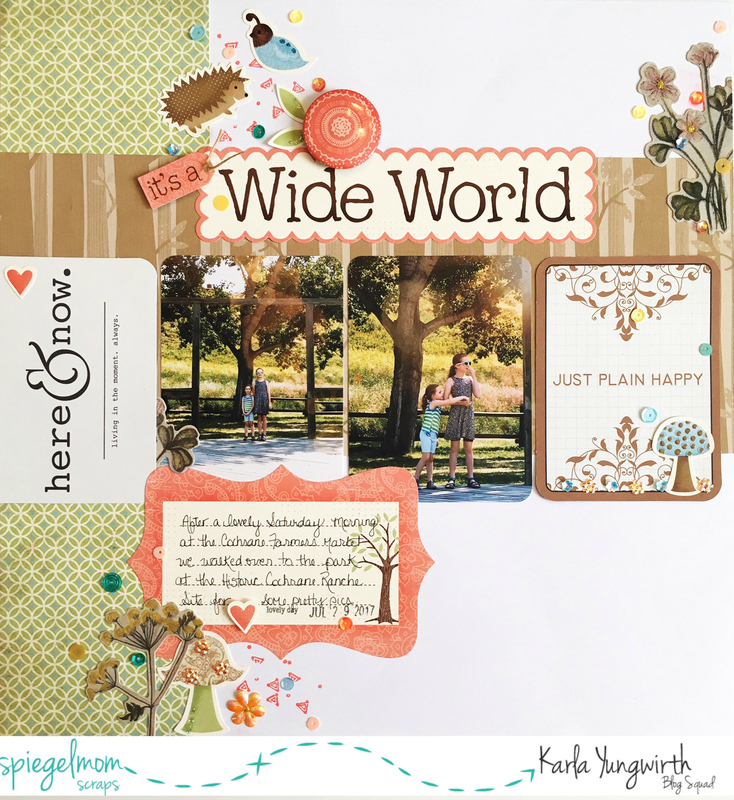 Don't forget to head over to the SpiegelMom Scraps blog to see all the details and closeups on this layout :) And I hope you have a very happy, very crafty week! Ninabrook Paper Crafters - Using My Mind's Eye Jubilee collection purchased from the Ninabrook Shop!